The Sault Ste. Marie International Railroad Bridge has nine camelback truss spans crossing the St. Marys River with bascule and vertical lift bridge components crossing the American Locks at the St. Marys Falls Canal. It is the only bridge in the United States known to include these three types of spans in a single structure to use an interlocking mechanism to connect the leaves of the double-leaf bascule span. 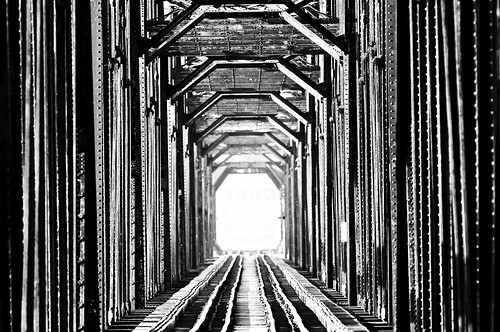 It is Michigan’s most significant railroad bridge from an engineering history standpoint and is eligible for listing in the National Register of Historic Places. Click through for some great old photos of the bridge and explore the various sections through Historic Bridges. Check this photo out on black and see more great shots in twurdemann’s Sault Ste. Marie 2012-2013 slideshow. More Michigan bridges on Michigan in Pictures.